Prin. Dr. V.S. Adigal (6th August 1961) holds degrees of B.A. (Economics), M.A. (Economics) from Shivaji University, Kolhapur & Ph.D (Rural Economics) from Mumbai University. · 31 years teaching experience (UG- 31 years & PG- 15years). 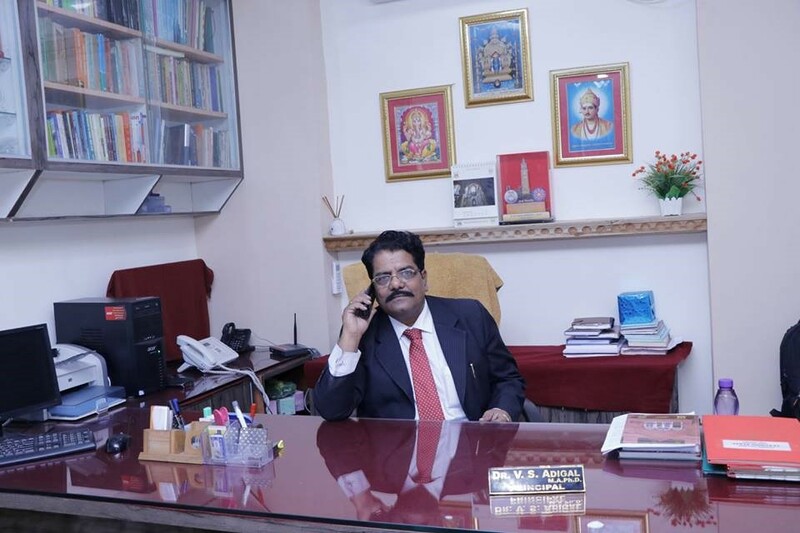 · Currently he holds the position of Principal and HOD in (Business Economics), at Manjunatha College of Commerce, Thakurli (East). · He has worked as a member of Board of Studies Business Economics, University of Mumbai from 2010-2015 and also remained as a member of Board of Examination in the subject of Business Economics. · He is honored with Number of Awards by Voluntary and Business organizations to mention few “Indira Gandhi Excellence Award from International Business Council, New Delhi“. Recently Received “Best Principal Award from YMT College of Management, Kharghar”. Recently, “Education Today Foundation(ETF)” Thane Presented "Lifetime Achievement Award" for Outstanding contribution to the Society in the field of Education on 10th April 2017., sponsored by Arya Gurkul Group of Educational Institution. · He has attended and contributed as a resource person in a number of conferences/ academic seminars/ workshops at different Universities and colleges. He has undertaken research projects & presented many papers at international, national and/or state level seminars and conferences. He has travelled four countries namely Portugal, Bangkok, Singapore and Sri Lanka to present his research papers. His entire team from India was awarded the medal for “Overall Best Performance” in the Conference held at University of Algarve Faro, Portugal hosted by Shefield Hallam University” UK England, organized by Faculty of Economics. He received the honor of chairing the session at Singapore. · He received an award for outstanding Research Papers at International Conference from University of Mumbai. He was also conferred an award for “Best Paper Presentation” at International Conference held at Jaipur. He has been invited as a Key Note Speaker as well as chaired different technical sessions at National and International Conferences. · Three students successfully completed their M.Phil Degree under his Guidance from YCMOU. He is a recognized guide for PhD degree in Business Economics, in University of Mumbai and has been invited as referee for PhD evaluation by other Universities. He has published thirty four research articles in different reputed books, magazines, journals, periodicals at the National and International Level. · He remained as Chief Editor for three books published at the National Level by Delhi Publications.